Apollo 17 Astronaut Jack Schmitt says he needs an extra sample bag. Mission Commander Gene Cernan is not at all surprised that Jack has found another interesting rock, and hands him the bag. 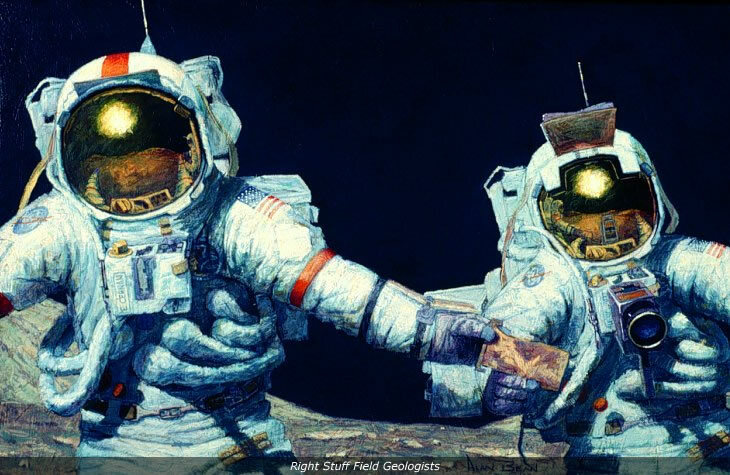 After all, Jack was a geologist by profession before he was selected as an astronaut. He even has a doctorate in geology from Harvard. Gene Cernan's background is in military aviation. All of us who have flown in space have a background similar to Gene's because the skills needed to fly spacecraft are an extension of those needed to fly high-performance aircraft. But getting there and back is not enough. We needed astronauts who could make the best scientific observations once they were actually on the Moon. NASA was faced with the question, "Do we take test pilots and teach them geology of do we take geologists and teach them to fly?" They decided to try both. Jack was sent to Air Force pilot training immediately after his selection. The rest of us received hundreds of hours of geology training in the classroom, in the laboratory, and in the field. As Gene would say, "I don't think either one of us outdid the other. We used our individual background and expertise where it had to be used. I took extra care of the off-loading of the rover and, during that period, Jack took time to look around, survey the situation, and plan our next move. Then we both went to work."